Those looking for a way to help fellow Charlotte citizens in need will find volunteer opportunities through local plumbing company E.R. Plumbing Services. Charlotte plumbers E.R. Plumbing Services is sponsoring or participating in four Charlotte community service initiatives this holiday season. Those in the Charlotte area are invited to join in and make a difference. When a child is diagnosed with an illness or disease that is beyond the typical scope of conventional treatment, St. Jude Children’s Research Hospital may be a family’s only hope. Ever since St. Jude Children’s Research Hospital opened its doors 50 years ago, the treatments discovered through research conducted at St. Jude have transformed pediatric cancer treatments, bringing the childhood cancer survival rate from a devastating 20 percent to over 80 percent. The discoveries made at St. Jude’s are improving child health around the globe. On December 7, 2018, E.R. Plumbing Services will be answering phones at the St. Jude Children’s Research Hospital radio-thon hosted by 96.9 The Kat. Results will be posted on the E.R. Plumbing Services site after the event. E.R. Plumbing Services believes families in need shouldn’t have to chose between paying rent and giving kids presents. That’s why E.R. Plumbing Services partners with the Charlotte Metro Police Department to collect toy donations throughout December and deliver toys to families on the December 14th CMPD Toy Drive delivery day. Those interested in helping can volunteer to work in the warehouse sorting and preparing donated gifts, donate gifts to be given to families in need, or possibly participate in the delivery of gifts (if the need exists). Volunteers must register through the Salvation Army link provided on the CMPD website and on the E.R. Plumbing Services website. When a family becomes homeless, hopelessness often follows. Bright Blessings lifts the spirits of homeless children by providing comforting stuffed animals, literacy materials and care packages for homeless parents. In November, E.R. 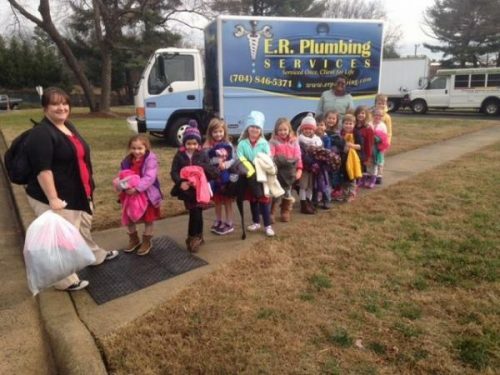 Plumbing Services delivered truckloads of stuffed animals and literacy materials to be distributed to kids in needs. E.R. Plumbing Services is involved with Bright Blessings year round as needed. Community needs don’t disappear after the holidays are over. Once again E.R. Plumbing Services is partnering with WSOC TV for the Channel 9 Steve’s Coats winter outwear donation drive. Coats can be dropped off at the E.R. Plumbing Services office beginning in January. Check the website for details.